Edit: Thanks very much Peter, I'll just admire from afar and put them down as Philodromus sp from now on. Hi, I've just started up with spiders and found them to be a lot more difficult than I imagined. However I'm persevering and wondered if this could be Philodromus aureolus. The epigyne looks similar I thought but would like confirmation. 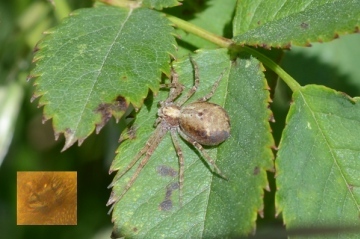 The Philodromus aureolus group is one of the most difficult to identify to species level, and one where many misidentifications have occurred. P. praedatus and longipalpis seem to provide the greatest difficulty and records of these should involve voucher specimens checked by an experienced arachnologists familar with the species. Very careful microscopical examination of adult female epigyne/male palp is essential, and sometimes dissection is required for confirmation. It is impossible to be sure from your photograph and the small size of the inset epigyne, but it appears to show the arch dividing the epigyne of cespitum. However it simply isn't possible to see enough without a specimen under a microscope. Yes, your pictures appear to show the eggsac of Paidiscura pallens, one of the very few spiders whose eggsacs are identifiable to species. I spotted this amazing structure on the underside of a sycamore leaf the other day and have provisionally identified it as Paidiscura pallens. Could anyone help confirm this or point me in the right direction if this is not correct. It was recorded in a wooded valley in the Vale of Glamorgan, South Wales. Thanks so much in advance for your help! Hopefully pic attached. Many thanks Evan for your help and for those two fantastic web sites. I will look much harder into the group species first and not just think it might be that one. I have now rename the spider as wolf. Re Paul Cobb possible Raft Spider. Not that one Paul. You will be surprised by how big they are when you see a Raft Spider!. It looks like a Pardosa wolf spider. for pictures of Lycosidae Wolf Spiders and Pisauridae including the Raft Spiders. Many thanks for your help on the id of this jumper, i have now uploaded two photos to the Species index and will try to find a male to go with her. I also captured a Heliophanus ? , so small and fast. How ever i do have a day to my self early part of next month and fingers cross for a sunny day i will be spider hunting at Alder hills. Yes, I agree this must be a female Aelurillus v-insignitus. I see this so rarely, it didn't cross my mind. The males are nice things. If we were in Europe, there would be a bigger problem, since many female Aelurillus are closely similar in appearance. Your location of Alder hills nature reserve SZ062930 looks excellent habitat from google aerials, albeit surrounded by a lot of housing and retail development. I guess it only occurs here because the location forms part of the much wider heathland landscape of Dorset and Hampshire. There might be a lot of interesting things to find on this site! Yes Paul. I am actually certain that this is Aelurillus. It is quite an uncommon spider except in certain areas in the South. Sitticus pubescens is really common on houses and looks a lot like this. Nice find though. You must be looking in 2 classy habitats! 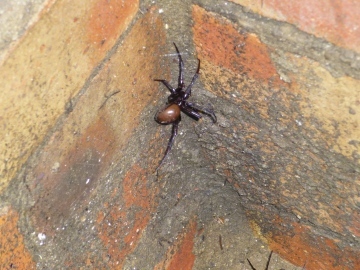 The male is also a cracking spider. Peter will be glad of the location details. I wonder if it is known from both your sites. 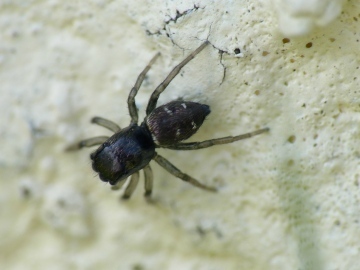 Hi Peter has seen the Spider photo,s and came up with the nearest to this would be Sitticus pubescens,but not sure. The spider id of Aelurillus v-insignitus is a much close match. Hi Paul, The right habitats I think. I do not know this species very well. Where is Peter when we need him! They do look very much the same spider and marking down the back, the area where these spider like is almost the same sunny areas on heathland, and also on short, stony calcareous grassland. I would happy rename the spiders id if someone else would agree. Both pictures look like Aelurillus v-insignitus females I think. With Clubiona you will not get to the degree of detail needed with a lens - look in the Collins Field Guide on spider of Britain and north-western Europe to see the number of Clubiona and the detail in the adult male palps, which will not be discernible adequately using a lens. With some very few exceptions, it is simply not possible to be sure of an id in this genus without the use of a microscope. A very few species provide clues because they have specific patterns such as Clubiona comta and the much larger C. corticalis, but otherwise you are left with subtle differences in size and sometimes body shape etc as the main guidance in the field - but this cannot be used for more than guesswork identification in the field. Female epigynes can be even more problemmatic, even presenting some difficulty under a microscope on occasions where the details visible don't obviously match the figures in the books. Clubiona are certainly not the genus to choose to begin identification to species level! In the habitat you describe, there are a number of likely species, C. pallidula, C. terrestris and more, but only a specimen will determine which one. Thank you for the update. It is as I feared - not as easy as it looks. For info: I found the spider low down, just above ground level within wet, ash and maple woodland, on lime rich clay soils. Other than in periods of prolonged drought, the undergrowth generally remains remains damp and lush. Next time I shall try an 8-diopter lens on the front of my macro lens and attempt to get that detail. Your picture is certainly an adult male Clubiona species, but it could be any one of a number of species. The only way to be sure is by microscopical examination of the male palp, where each species has a distinctive structure not visible in a photograph in sufficient detail to see the necessary diagnostic bits. 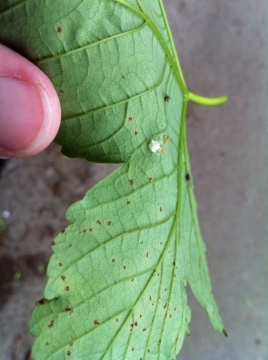 Your photo suggests the spider was on the leaf of a bush or tree? If so it is very unlikely to be Clubiona reclusa, a spider usually found in tall grassland, herbage or the drier parts of marshes. There are a range of possibilities both with Clubiona found in grasslands and herbage and those usually found on trees or scrub and only a few species are at all distinctive in their pattern. It is a genus of look-alikes! I've just joined so that I could upload a photo of what I hope is Clubiona reclusa. I am a complete ignoramus when it comes to spider IDs, so as normal, I did a search of the web so that I could label my photo. My search led me here and noticed that an image was required. 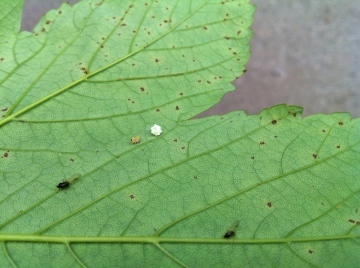 I hope that I have the identification correct and in some small way have contributed to the site. A bit about myself: I'm retired and a member of the Warwickshire Wildlife Trust, where I wander around taking photos of the local wildlife, big or small, fur or feather, though my passion is photographing hoverflies. I look forward to meeting more spiders! Interesting subject Matt. Portia is an unusual jumping spider and has been studied in some detail because of this. I think that it is the flexibility in prey identification and the subsequent the hunting strategies that it uses for different prey including different spider species that make it remarkable. It is one of the species that have prompted serious doubts about the assumption that small invertebrates are not that clever. I think there was a nice National Geographic photo-article featuring Portia by Mark Moffat based at Harvard several years ago. 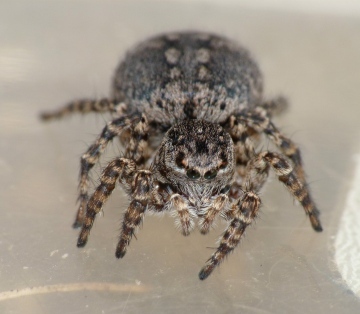 A topic about spiders stalking prey on the WildAboutBritain forum prompted a quick bit of research, and tied in with a pub conversation at the recent BAS AGM. This is probably old news to many of the Arachnologists that frequent the forum, but pretty interesting stuff for less well read members like myself. Portia fimbriata from Australia, a salticid that often hunts other salticids has some interesting hunting strategies. Closer to home, the common salticus scenicus would make a good subject for research along the same lines perhaps. 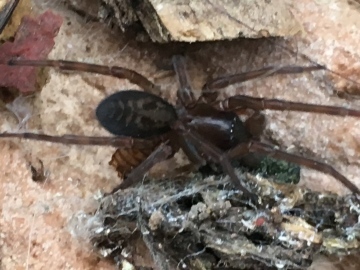 If you can send me a spider, to Peter Harvey, 32 Lodge Lane, Grays, Essex RM16 2YP I will be able to confirm your species. A spider will be quite safe inside a small plastic container with a very little dampened tissue (cave spiders like humidity) inside a padded envelope. Please include a location (postcode or Ordnance Survey grid reference) so that your record can be added to the recording scheme. What type of cave spider is this? Is it unusual to find it in Norfolk? re: jumper id.. Heliophanus ? Yes, Heliophanus, by the look of the legs still a juvenile. There are a very large number of European species and we have not found pattern or leg markings completely reliable in Essex, so id to species level needs microscopical examination of an adult. Why looking for new jumpers to capture , i spotted this little one moving a round.It was only 3-4 mm in size a gave my a good run around before i had a good image. Many thanks for looking. As before i have loaded the grid ref point on the main photo.